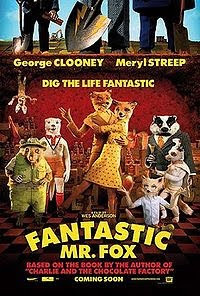 Fantastic Mr. Fox was the second big stop-motion movie of 2009, and while I didn't like it as much as Coraline, it was still really enjoyable. As the poster says, it's based off a book by Roald Dahl, one of the great children's authors of all time. I didn't actually love the book when I read it, and if it was going to be adaptated into an exact movie form the film would only be about 30 to 40 minutes long. But director Wes Anderson, who by the way isn't known for any other movies rated PG or less, manages to create a working, cohesive storyline. Other main characters in the story include Mr. Fox's son, Ash, who considers himself a great athlete and is jealous of his cousin, Kristofferson, who does pretty much everything better than him. In Ash's eyes, Kristofferson is the misfit or country boy, and Ash hates him for drawing all his dad's praise and attention and for somehow getting all the girls. Kristofferson doesn't understand his cousin's wrath towards him. Eventually they minimize their differences and learn to respect each other. A classic relationship, but the characters are written very cleverly. The actors were given a lot with which to work. The script is very clever. Kids will laugh at the antics and mischief of Mr. Fox, and many of the jokes will crack up adults. A good family movie should appeal to kids and adults. Unlike Toy Story, Wall-e, or 80% of 2009's animated films, Fantastic Mr. Fox seems to appeal more to adults and older children, but can still be enjoyed by some kiddies. The stop-motion animation is fine, but not the film's strong point. Don't get me wrong. Stop-motion is without a doubt my favorite form of animation, but I think Coraline's animation was much more magical than Fox's. It's interesting that this film uses hardly any special effects. Water splashes and streams seem to be made out of a sort of clay. Fire effects look like orange and yellow cardboard pieces. The dust trails the animals make when they run look like cotton balls... it adds a very simple, but distinctive art flavor to the film. The movie's score is one of its strongest points, with tunes ranging from cheery during the night raids on the farmer's properties to eerie amidst the sewers beneath the farms. So it's definitely not a big-screen movie, and anybody who paid to see it there honestly burned 10 bucks. But for $15 or so you can watch this little gem over and over again on dvd. In my opinion, it's the 3rd best animated film of 2009 behind Coraline and Up. Other quickie notes: I saw Monsters vs. Aliens not too long ago. I'm not even going to italicize it. It told about 2 more funny jokes than the trailer did. i.e., it told about 2 funny jokes. I also saw G-Force. The trailer was funny because it was stupid. The movie itself was not funny, and stupid. I saw the trailer for HP7. Can't wait!! !